Spitfire Is of 19 Squadron, based at Duxford in Cambs, flying in echelon formation. Leading the flight is the squadron commander, Sqn Ldr HI Cozens in aircraft K9794. Image dated 31 October 1938. 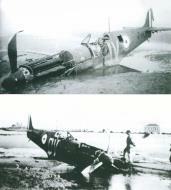 The squadron was the first to receive the Spitfire in August 1938 and these early aircraft are fitted with the original two-bladed wooden propellers but have had the original flat cockpit replaced by the more familiar bulged canopy. The '19' painted on the tail was removed soon after this picture was taken. Flight-Sergeant George "Grumpy" Unwin of No. 19 Squadron RAF climbs out of his Supermarine Spitfire Mark I at Fowlmere, Cambridgeshire, after a sortie. Unwin shot down 14.5 enemy aircraft between May and September 1940. The Intelligence Officer of No. 19 Squadron RAF (back to the camera) receives pilots' accounts of a sortie at Fowlmere, Cambridgeshire. The pilots are (left to right): Squadron Leader B J E 'Sandy' Lane (Squadron Commanding Officer), Flight-Lieutenant W J 'Farmer' Lawson and Sergeant D Lloyd. Groundcrew refuelling Supermarine Spitfire Mark IIA, P7420, of No. 19 Squadron RAF from a tractor-drawn petrol bowser at Fowlmere, Cambridgeshire. This newly-arrived example was one of the few Spitfire Mark IIs to fly operationally with a front-line squadron before the end of the Battle of Britain. 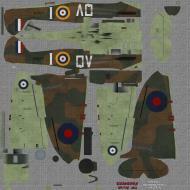 Spitfire Mark IA, X4474 QV-I, of No. 19 Squadron RAF, taking off from Fowlmere, Cambridgeshire, with Sergeant B J Jennings at the controls. Spitfire Mark IA, X4179 QV-B, of No. 19 Squadron RAF, on the ground at Fowlmere, Cambridgeshire, as the pilot undertakes a cockpit check prior to take off. Three pilots of No. 19 Squadron RAF confer at Fowlmere, Cambridgeshire, after a sortie: (left to right): Flight-Lieutenant W J 'Farmer' Lawson, Squadron Leader B J E 'Sandy' Lane (Commanding Officer) and Flight-Sergeant G C 'Grumpy Unwin. Squadron Leader Brian 'Sandy' Lane, CO of No. 19 Squadron (centre) confers with Flight Lieutenant Walter 'Farmer' Lawson and Flight Sergeant George 'Grumpy Unwin at Fowlmere near Duxford, September 1940. Supermarine Spitfire Mk IA, P9368 'QV-K', of No. 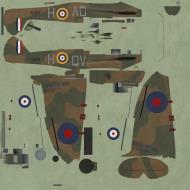 19 Squadron RAF, being rearmed between sorties at Fowlmere, Cambridgeshire. P9368 was often flown by the Commanding Officer, Squadron-Leader B J E 'Sandy' Lane, and was also the preferred aircraft of 'A' Flight commander Flight-Lieutenant W J 'Farmer' Lawson. A group of pilots of No. 19 Squadron RAF discuss a recent sortie by Manor Farm at Fowlmere, Cambridgeshire. Standing from left to right are: Sergeant B J Jennings, Flight-Sergeant G C 'Grumpy' Unwin, unknown, Flying Officer H S L Dundas (of No. 616 Squadron RAF), Flight Sergeant H Steere, and Squadron-Leader B J E 'Sandy' Lane, the Squadron's Commanding Officer. Flight-Sergeant Unwin's pet German Shepherd dog 'Flash' can be seen to the left. A Supermarine Spitfire Mk.I aircraft of 19 Squadron banking. Three Supermarine Spitfire Mk.I aircraft of 19 Squadron in 'V' formation. Six Supermarine Spitfire Mark Is of No 19 Squadron Royal Air Force based at Duxford, Cambridgeshire, flying in echelon formation led by the squadron commander, Squadron Leader H I Cozens, in K9794. Note the two-blade fixed-pitch wooden propellers, fitted to early examples of the type, and the squadron number painted on the fins shortly before the flight and removed soon afterwards. Wing Commander George 'Grumpy' Unwin, who has died aged 93, was one of the most successful fighter pilots during the Battle of Britain and was twice awarded the DFM; he was one of only 60 men to receive the double award during the Second World War. 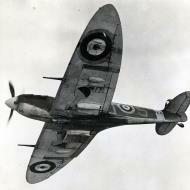 In August 1938 Unwin was a sergeant pilot serving on No 19 Squadron when it became the first to receive the Spitfire. He was one of the original RAF pilots to fly the new fighter and, in the early days, he flew regularly as Douglas Bader's wingman. No 19 was heavily engaged during the Dunkirk crisis in May 1940. Although an experienced pilot by then, Unwin was not allocated an aircraft for the first sortie. He complained bitterly, and it was this that earned him his nickname, which remained with him for the rest of his life. He was in action the next day, however, and soon registered his first success. The squadron was in the thick of the intense fighting, and, by the end of the evacuation, he had claimed the destruction of five enemy aircraft, two of them unconfirmed. advertisementUnwin flew throughout the Battle of Britain, mainly from Duxford. On August 16 his section of four aircraft attacked a large formation of fighters escorting bombers, and he shot down one fighter over Clacton. 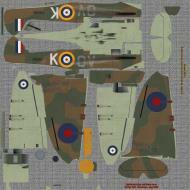 Early September saw the introduction of the controversial Bader 'Big Wing' employing three squadrons, including No 19. The wing flew its first offensive patrol on September 7. After attacking a fighter, Unwin became detached from the rest of his formation. 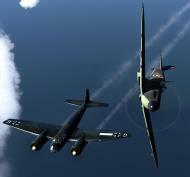 Finding himself alone, he saw Hurricanes engaging a big formation of bombers and went to assist them. A large force of Messerschmitt Bf 109s immediately attacked him over Ramsgate, and he turned to engage them. He hit at least five and two were confirmed as destroyed. On September 15, the height of the battle, Unwin and his section attacked a force of 30 Bf 109 fighters escorting a large formation of enemy bombers. He dived on one and shot down one of the escorts over London before climbing back to height, where he found two others flying alone. He shot down both. Two days later he was awarded an immediate DFM for 'his great courage in shooting down 10 enemy aircraft'. Over the next few weeks Unwin accounted for three more German fighters and he shared in the destruction of two others. He achieved his final success on November 28, when he was patrolling over a convoy. Early in December it was announced that Unwin had been awarded a Bar to his DFM. The son of a Yorkshire miner, George Cecil Unwin was born on January 18 1913 at Bolton-on-Dearne. He was educated at the local grammar school, where he was a fine footballer (he later turned out for the RAF). Determined not to join his father in the mines, he answered an advertisement offering apprenticeships in the RAF; he joined as a boy clerk when he was 16 and trained at the air force's apprentice school at Ruislip. After serving at Uxbridge for four years Unwin was selected for pilot training in 1935 and the following year he joined No 19, flying the bi-plane Gauntlet fighter. He served with the squadron for four years, and was one of the very few to fly in action throughout the Battle of Britain and survive unscathed. In December 1940 he was rested. Initially, Unwin would not apply for a commission, since a senior flight sergeant earned a few more shillings than a junior officer. Once the rules were changed he relented, and was interviewed a number of times; but his background and passion for football did not impress the selection boards. A colleague tipped him off that an interest in horses would make a good impression. For his next interview he decided to tell the panel of his knowledge and love of horses. The board accordingly recommended him for a commission - he had omitted to tell them that his experience was limited to the occasional meeting with the pit ponies at his father's coal mine. He was made a pilot officer in July 1941. Unwin became a flying instructor, first at Cranwell and then at Montrose, where he remained until October 1943. He then converted to the Mosquito before joining No 613 Squadron in April 1944; he was based at Lasham and employed on night intruder operations. As D-Day dawned, No 613 roamed behind enemy lines attacking fuel supplies, airfields and road and rail links. By October Unwin had flown more than 50 intruder operations, and he was sent to the Central Gunnery School as an instructor, remaining until June 1946. 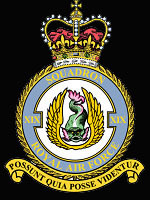 With the resurrection of the Royal Auxiliary Air Force, he joined No 608 (North Riding) Squadron as one of the regular RAF pilots training the squadron's weekend flyers. Unwin was given command of No 84 Squadron in August 1949, flying the Brigand aircraft from RAF Habbaniya in Iraq. Within months No 84 was transferred to Singapore to provide ground support during the Malaya emergency. The Brigand was not a popular aircraft, and the squadron suffered a number of losses. 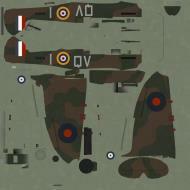 Unwin spotted that some were due to premature explosions in the Aden gun carried under the fuel tanks of the aircraft. He was critical of the Brigand's performance and was always prepared to display its weaknesses to higher authorities. Nevertheless, he led the squadron on more than 180 rocket and dive-bombing attacks against terrorist positions. Not many commanding officers played football, but Unwin was a regular member of the squadron team until he broke a leg. He was invalided home and given a ground appointment as a wing commander. Shortly afterwards it was announced that he had been awarded the DSO, one of very few awarded to the RAF for operations during the Malayan campaign. In 1955 Unwin returned to Singapore in charge of administration at the large RAF airfield at Tengah, where he still found time to fly the station's jet fighters. Three years later he returned to England to become the Permanent President of Courts Martial. He once commented: 'I presided over 300 courts martial, and not one chap was found guilty of low flying.' He retired from the RAF in 1961. In retirement Unwin was the Controller of Spastics Appeals for the southern counties, but he never considered that to be work. A passionate golfer with a handicap of six, he lived within walking distance of the Ferndown Club, in Dorset, where he served for many years on numerous committees. In earlier days he played seven days a week, once commenting: 'I cut it down to five times in winter.' He continued playing until he was 90, but visited the club two or three times a week until his death. George Unwin, who died on June 28, married Edna ('Jimmie') Cornwell in 1939; she died last year. Taken from the Telegraph obituary.